National Geographic is justly famed for its professional photojournalism, but the photos that readers themselves shoot and submit are nothing to sniff at, either. Every weekday, the magazine's editors choose their Daily Dozen favorites, and those that are rated highest by online visitors are made available for download in National Geographic's Weekly Wrapper as computer wallpaper. 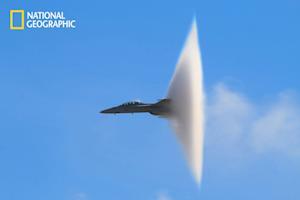 The "vapor cone" shown here was shot at the Miramar air show in San Diego by Steve Skinner. Besides desktop wallpaper, National Geographic also turns the Daily Dozen shots into electronic slide puzzles, jigsaw puzzles and more.